Saturday, 29 October, 2011 – 7.30 p.m. This year, we are thrilled to welcome a fabulous encounter between two talented artists from the feminist music scene! Franco-Senegalese singer-songwriter Kadja Nsé world is a joyful one. She expresses her dual heritage by moving gracefully from rock to reggae and soul to pop, while her guitar gallops to the rhythm of West African sounds for a surprising Afro-pop fusion. As an "Afro-pean" citizen of the world, Kadja Nsé has chosen to express herself in a language that knows no borders, even though she also likes to write in French, her mother tongue. She is currently working on her first album, whose release is scheduled for 2012. 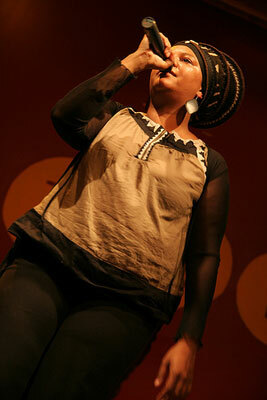 Rocked to Tunisian rhythms since infancy, Narjess started drumming as a child. It was in 1997, when she met the percussionist Guem, that Narjess knew for sure that she would turn her passion into a profession! 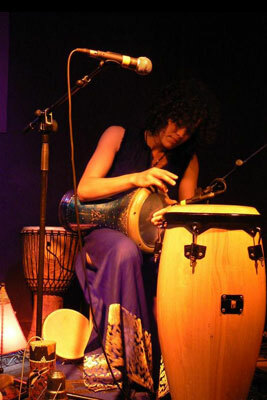 Her trip to Mali and her encounters with the musicians François Dembélé, Abdoulaye Diabaté and Salif Keita allowed her to explore new techniques and to extend her skills to other instruments. Free-wheeling and free-spritied, Narjess’s style is a reflection of her inner self: sensitive and generous. Let yourself get caught in her groove, and feel the emotion!